Vinod Bhatt B Sc (Zoology, Botany & Geology). Post that, he did Masters in Botany followed by Ph D in Plant Pathology. He worked as a Professor of Botany at Pauri Campus for some time before joining an NGO called Academy for Mountain Environics where he worked for 2 years. 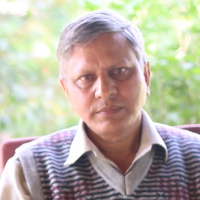 He has been working with Navdanya Biodiversity Farm since 1997 and is an Executive Director there. "I did B Sc (Zoology, Botany & Geology) from DBS, Dehradun. Post that, I did Masters in Botany followed by Ph D in Plant Pathology. I worked as a Professor of Botany at Pauri Campus for some time before joining an NGO called Academy for Mountain Environics where I worked for 2 years. I have been working with Navdanya Biodiversity Farm since 1997 and am an Executive Director there."